This is a great recipe if you’re looking to make an easy nutritious meal and your hunger can’t wait – it only takes 15 minutes in total to put together. If you eat meat, always try and choose a lean, low-fat form of protein like chicken or turkey over fattier red meats. We’ve opted for breast meat, which is much less fatty than the darker meat of the leg or thigh. Always remove the skin on chicken, as this is a high source of fat – the seasoning we use in this recipe more than makes up for any flavours you feel might be lost by removing the skin. For an even healthier protein alternative, substitute the chicken for grilled fish. Alongside the crisp flavours of red onion, red pepper and iceberg lettuce, we’ve used Greek yoghurt and salsa to add a sharp kick to this meal. Greek yoghurt is one of the healthier dairy options available if you want to add a sour twang to your meals. Using salsa allows you to add heat, acidity and extra vitamins, as well as a powerful flavour without the need for adding salt. Both of these dressings are very low saturated fat and cholesterol content, making them ideal for a healthy heart diet. To cut down on the sugar content of store-bought salsa, why not make your own salsa? This can be made by simply mixing together 1 large tomato, 1 chilli peper and 1 onion (all finely chopped), with some chopped coriander and a tablespoon of fresh lime juice. Add a little pepper to give it more of a kick. Heat the oilive oil in a pan and sauté the chicken for 3-4 minutes. Remove the chicken and sauté the garlic, onion and peppers for 5 minutes. Return the chicken to the pan, and add the vinegar, oregano and pepper. Add a layer of lettuce to the tortilla, then spoon the chicken and veg mixture. 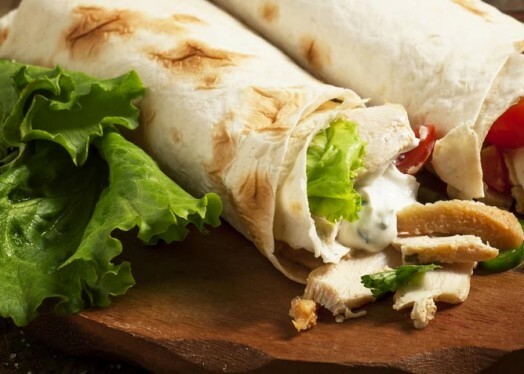 Cover with 1 tbsp of salsa and 1 tsp of Greek yoghurt per wrap, roll and serve.